No added sugars? No way. In fact, according to researchers, full-fat dairy foods are actually good for you. All the way back in 1992 researchers from the University of Texas, Houston, started tracking a group of nearly 3000 volunteers over the age of 65. They kept track of their health status and diet, including their dairy intake, for 13 years. For decades, full-fat dairy has been on the “no” list. Eating it was supposed to drive up our cholesterol, clog our arteries and cause heart disease. 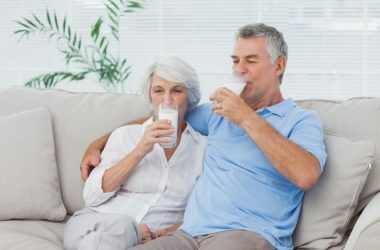 In fact, one specific fat found in whole milk and other full-fat dairy products, heptadecanoic acid, was associated with a 42 percent LOWER risk of a devastating stroke. But this isn’t even the only evidence that full fat dairy isn’t the monster it’s been cast as. Far from it. Three other major studies have already come to the same conclusion. Back in 2016, researchers from Harvard University thought they had finally put the high-fat dairy question to bed. In a massive meta-analysis, they crunched the numbers from three other ground-breaking health studies: the Health Professionals Follow-Up Study, the Nurses’ Health Study, and the Nurses’ Health Study II. It represented decades of research, and included data from nearly a quarter of a million people. And the Harvard team concluded there was no link between full-fat dairy and an increased risk of heart disease. None. So, how did full-fat dairy get such a bad rap over the years? Two reasons. And those low-fat, skim and fat-free dairy foods that are supposed to be healthier typically aren’t. Because when food manufacturers remove fat, sugar levels become more concentrated. Which means skim milk, for example, is much more likely to cause your blood sugar to spike. The bottom line is it’s time to ditch the fake stuff and the tasteless fat-free options too. Embrace full-fat dairy again instead. And the next time you order your iced coffee, look the barista right in the eye and ask for whole milk. Not only will it taste better, it’ll be better for you!